News for Week 2 of Apr 2014; the biggest news was the launching of MOLPay - cash payment for e-commerce. Microsoft Corp. today announced revenue of $20.40 billion for the quarter ended March 31, 2014. Gross margin, operating income, net income, and diluted earnings per share for the quarter were $14.46 billion, $6.97 billion, $5.66 billion, and $0.68 per share, respectively. Huawei, a leading global information and communications technology (ICT) solutions provider, recently held its 11th Annual Global Analyst Summit, attracting nearly 400 analysts and business leaders from world-class companies such as BT, Intel and Volvo. 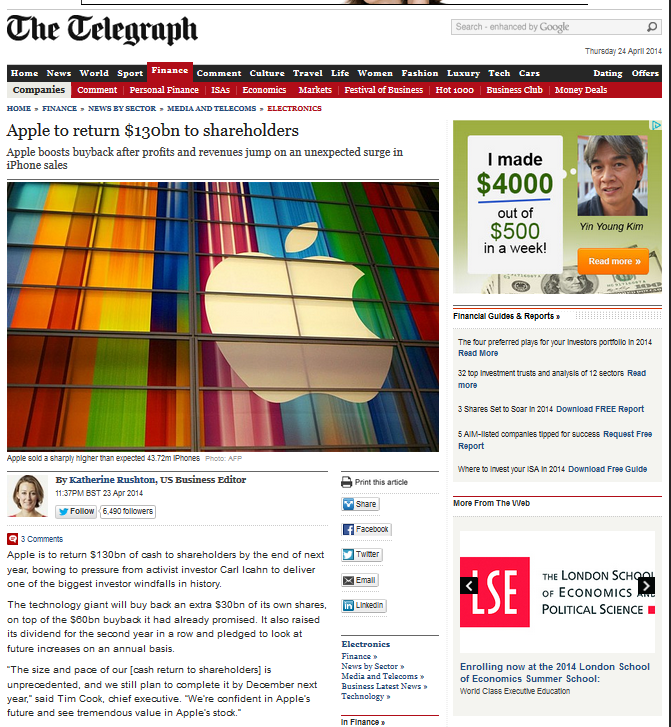 Telegraph reported that Apple is to return cash of $130bn to shareholders. The sum consists of a buy back of own shares amounting to a total of $90bn and increased dividend. ProphetStor Data Services, Inc., a leader in Software-Defined Storage (SDS), today announced further expansion into Asia with an office opening in Shanghai, along with the appointment of Robert Ye as General Manager of China. The new establishment will provide pre-sales and post-sales support, customer service and technical assistance to ProphetStor's growing base of customers in China. BuzzCity, the leading global mobile advertising network, would like to share its latest quarterly report on the mobile internet which includes a spotlight on mobile banking adoption and reveals mobile users’ attitudes towards mobile banking. The rise in mobile banking is being driven by better security and flexibility around mobile payments, as well as increased investment from tech companies. Interestingly, both developed and emerging markets are adopting mobile banking methods; perhaps not surprising as the rise in mobile has been exponential, but what is surprising is the fact that those surveyed simply do not feel that they “need” mobile banking as yet. The UnderBanked now make up 12% of mobile users. Today, Asia Pacific University of Technology and Innovation (APU), one of Malaysia’s premier private universities for courses in technology and innovation, announced that it has joined the EMC Academic Alliance (EAA) program. This was announced by Professor Leslie Trustrum, Vice Chancellor of the University, Cheam Tat Inn, Managing Director, EMC Malaysia and Krishna Kant, Head, EMC Academic Alliance, Southeast Asia, Russia & ANZ, EMC at the APU campus in Kuala Lumpur. The signing ceremony also saw EMC and APU come together to talk about the development and introduction to several new modules in the current curriculum for courses in IT, intelligent systems, internet technology, and enterprise computing. This collaboration is a part of EMC’s global academic alliance program, EAA, which aims to prepare students for successful careers in the IT industry. As a regional hub for EAA in Kuala Lumpur, APU will be the centre for EMC’s faculty training programs, seminars and workshops. APU will also help popularize EMC Academic Alliance amongst institutions in Kuala Lumpur so that EMC could enroll more EAA partners. Viber, the leading mobile communications platform offering free messaging and HD-quality phone calls, announced today the release of its redesigned iPhone app that is designed for iOS 7, bringing multiple enhancements to iPhone users. The company has simultaneously released a new mobile app for BlackBerry 10, bringing Viber to BlackBerry’s latest OS with many of the most popular Viber features for the first time. Violin Memory, a leading provider of all-flash storage arrays and appliances delivering application solutions for the enterprise, has announced the general availability of the Windows Flash Array (WFA). Jointly developed with Microsoft, WFA is the first all-flash high-performance storage array powered by Windows Storage Server 2012 R2 to deliver a rich set of high performance storage features and data services for the enterprise. Its unmatched speed and efficiency transforms the datacenter by dramatically reducing server overhead and application response times through improved storage performance, fundamentally altering the cost structure of enterprise applications. WFA enables enterprise and cloud workloads, such as SQL Server, Microsoft SharePoint, and Windows Server with Hyper-V virtualized applications, to meet the needs of global enterprises, while satisfying IT operational demands for maximized agility, automation, and orchestration between network, storage and compute resources. It is a tightly integrated combination of Windows Storage Server 2012 R2 and Violin’s award winning hardware and software into a single solution that delivers high performance all-flash array storage for enterprise and cloud customers. Cloud-based unified communications and social collaboration platform Unified Inbox officially sets up its international headquarters in Singapore, as a strategic move to grow the company globally and expand into the Asia region. Currently in the closed beta phase, the company has also secured top tier telco companies, ISP and media as partners for a global market roll out in 2015, as it sees the huge potential of this Communication-as-a-Service platform that gives users control of their communications flow across email, Twitter, LinkedIn or SMS. Their first offering is a Unified Inbox mobile app which allows users to manage all their incoming and outgoing messages centrally from within one interface. The offering is dubbed as Communication-as-a-Service platform. Brocade today announced the appointment of Gabriel Breeman to the newly created position of OEM director for Asia Pacific (APAC). 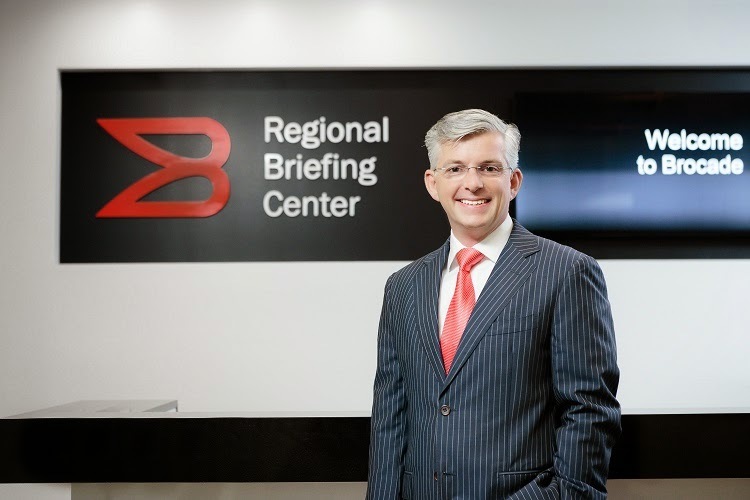 He will drive OEM strategies, strategic partnerships and alliance initiatives for the region to help position Brocade as the data centre networking partner of choice in the OEM partner business segment. Breeman will be based in Singapore and report directly to Brocade vice president for Asia Pacific (APAC), Adam Judd. Brocade’s worldwide OEM partners include EMC, Dell, Fujitsu, HP, Hitachi Data Systems, IBM and NetApp. In recent times, mobile searches have been effective in helping consumers make crucial purchase decisions swiftly with studies showing that 75% of mobile searches lead to follow-up actions such as purchases and word-of-mouth sharing. Realising this untapped potential in the E-commerce industry, Vserv.mobi, an award winning mobile advertising exchange, today announced the launch of Search Intent Ads, a new advertising format that integrates the power of search into mobile ads. In simple terms, Search Intent Ads is a new format of advertisement targeting mobile platform, where it is presented as a full-page advertisement with search capability and short-cut buttons - other more familiar of advertisement formats consist of image-based banner advertisement. Search Intent Ads is powered by the deep linking technology - to enable this, advertisers need to customize their contents (such as mobile e-commerce app), by leveraging on the SDK provided by Vserv.mob. SAS, the leader in business analytics software and services, has announced the appointment of Tan Yen Yen as regional vice president and managing director for SAS South Asia Pacific, based in Singapore. Yen Yen’s most recent role was with Oracle as senior vice president, Applications, Asia Pacific. Prior to that, she was vice president and managing director at Hewlett Packard, Singapore. She holds a Bachelor of Science from National University of Singapore and an Executive Master of Business Administration from Helsinki School of Economics Executive Education. In 2011, Yen Yen was named “IT Leader of the Year” by Singapore Computer Society for outstanding contributions to the IT industry in Singapore. Fusion-io today announced the Fusion ioMemory platform has been optimized for performance with SQL Server 2014. The Fusion ioMemory platform builds upon the in-memory innovation in SQL Server 2014, delivering up to 4x improvements in transactions per second and a significant reduction in data latencies in our testing. The transactional performance from Fusion-io flash memory products drives real-time insights for faster business decisions. SQL Server 2014 delivers new in-memory capabilities built into the core database for online transaction processing (OLTP) that massively speeds the process to analyze real-time transaction data. SQL Server 2014 In-Memory OLTP combined with the Fusion-io cut through architecture drives the highest performance level of transactions with the simplest, most cost-effective approach compared to legacy architectures. The AIMS Group (‘AIMS’), Malaysia and South East Asia’s leading carrier-neutral data centre and managed services provider, today announces that they have been awarded the prestigious 2014 Frost & Sullivan “Data Centre Services Provider of the Year”. VoltDB today announced a technology partnership with Flytxt, a leading Big Data analytics solution provider to Communication Service Providers (CSPs). Flytxt has successfully integrated VoltDB’s in-memory operational database with its real-time analytics platform, already being used in customer deployments to extract actionable intelligence from billions of events streaming each day from more than 200 million mobile subscribers. Flytxt’s Big Data analytics solutions enable more than 50 CSPs across 32 countries to increase revenues, reduce churn, drive data adoption and growth, optimize margins and generate new revenue streams through advanced analytical capabilities. Oracle has just newly launched mobile functionalities on the Apple App Store and the Google Play Store for download for Enterprise Performance Management. The solution is aimed to help organisations access enterprise performance insights and make informed decisions from any location via mobile devices. Muslim Pro, a mobile app created by Singapore-based apps factory Bitsmedia – as they today announced that it has hit over 10 million downloads across 216 countries worldwide since its launch less than four years ago! Muslim Pro is a comprehensive Islamic mobile application providing accurate prayer times based on a user’s location. They have an average of almost 3 million active users monthly – showing a engagement rate of nearly 30% of the people who have downloaded the app. Between 10,000 and 15,000 new users are added daily, but during Ramadan, downloads can shoot up to as high as 100,000 in a single day. Muslim Pro is available online at www.muslimpro.com, and as a mobile application for iOS, Android and BlackBerry on the Apple App Store, Google Play and BlackBerry World respectively. Tata Communications further expands its global data centre footprint by entering strategic partnerships with Pacific Link Telecom (PLT) in Malaysia, NEXTDC in Australia, as well as Interxion in Germany and Austria. These partnerships will enable Tata Communications to extend its current data centre offerings in these regions and to deliver a uniform customer experience across geographies. Tata Communications has one million square feet of colocation space across the globe and these new state-of-the-art partner sites in Malaysia, Australia, Austria and Germany will act as extensions to further expand its global data centre footprint.